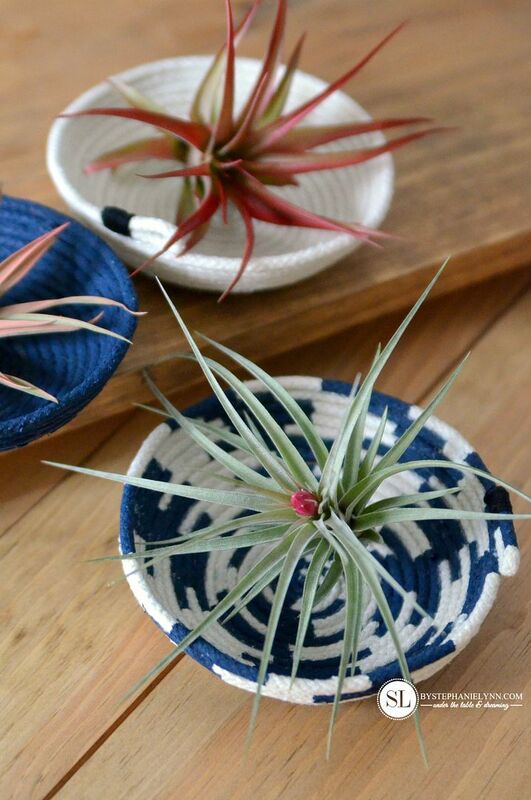 Painted Rope Bowls – #michaelsmakers | This time of year I start to get a little anxious waiting for spring. I can’t wait to get back outside, especially in the garden, and see some green. While we still have a little over a month to go, indoor plants are my sanity. I can never have enough. 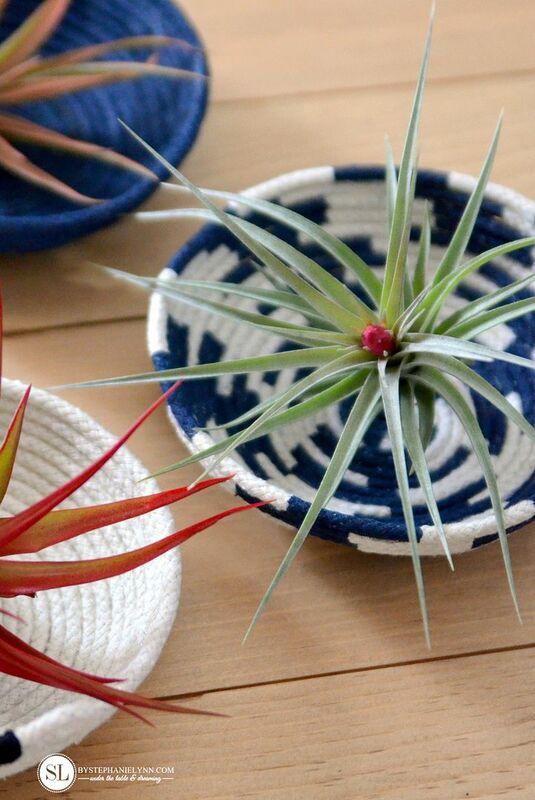 Along with succulents, air plants are another go-to when I’m in need of a little green. 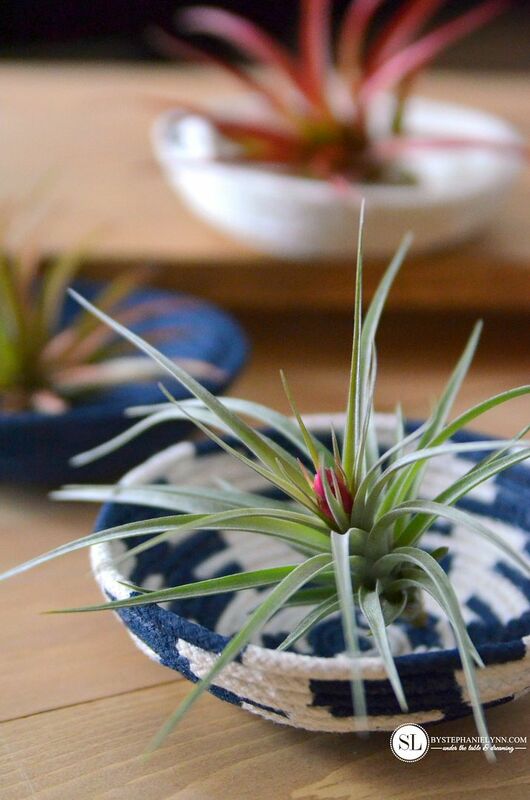 Air plants are incredibly easy to grow and so easy to care for – they do not even need any soil to thrive! These unique plants look great tucked pretty much anywhere, though I really like the idea of showcasing each variety in their own little vessel. 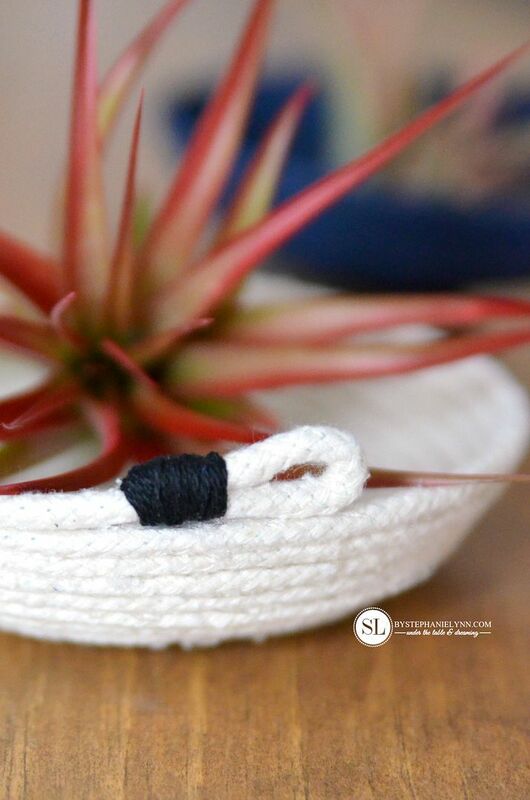 So I created a couple of rope bowls for each plant to call its home. Denim has always been a wardrobe staple and now it can be found in a new line from Michaels called Make Market. 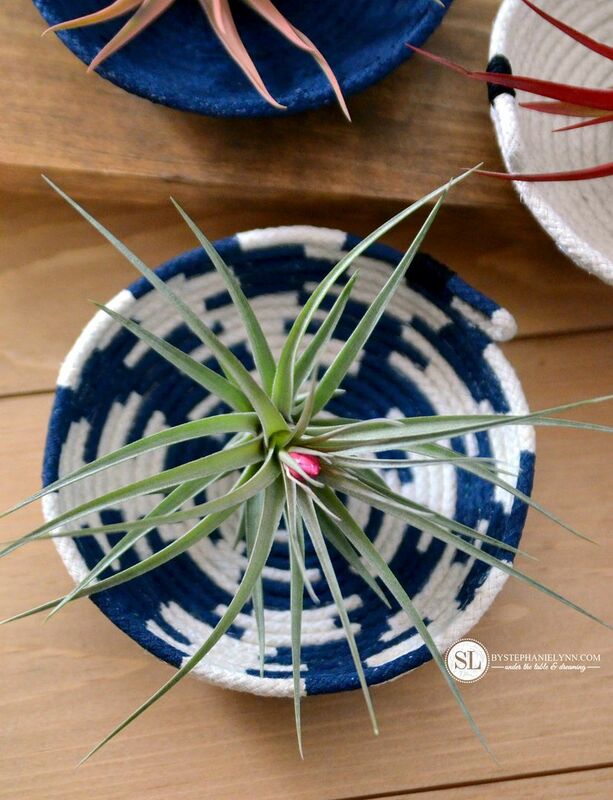 Make Market is a combination diy décor products made of on-trend surfaces and textures, like chalk, denim, burlap, galvanized, cork and metal. I was pretty excited to use the denim paint as part of this month’s Michaels Makers challenge. The rich indigo paired with the creamy cotton just screamed ‘nautical‘ to me and are a refreshing reminder that spring is right around the corner. 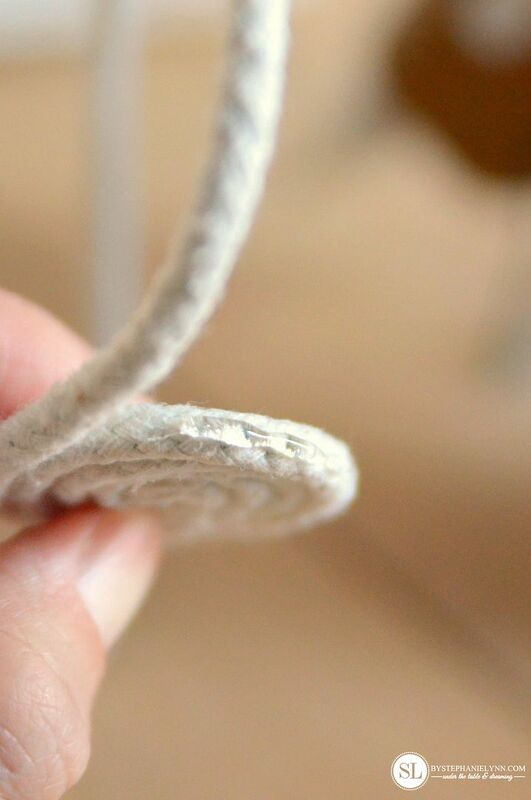 Step One: Place a dap of hot glue on the end of the clothesline to prevent the cotton from fraying. 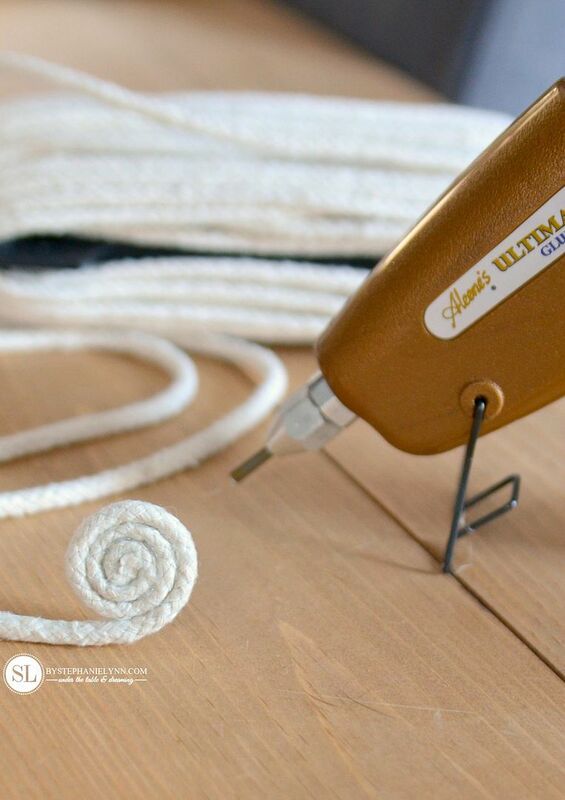 Immediately begin rolling the rope into a coil shape – adding additional hot glue to the perimeter of the coil as you go along. 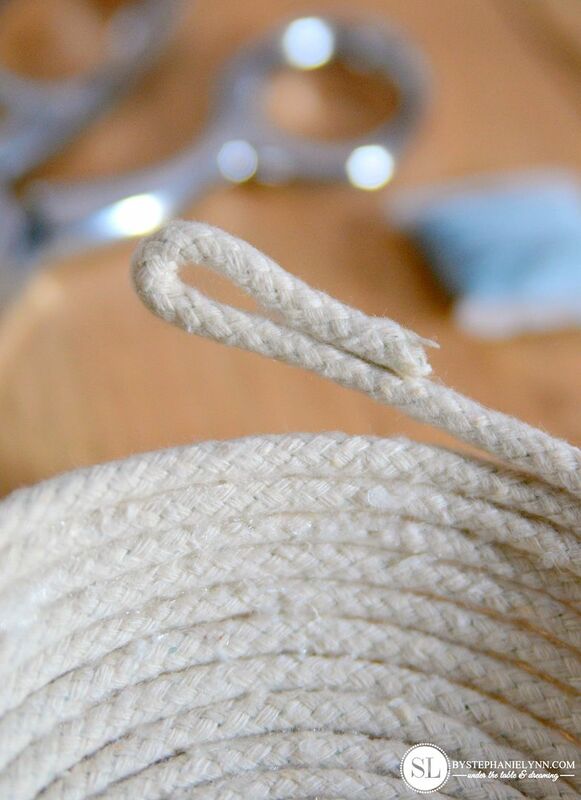 Tip: I prefer to leave the clothesline roping attached to the spool throughout the coiling process. 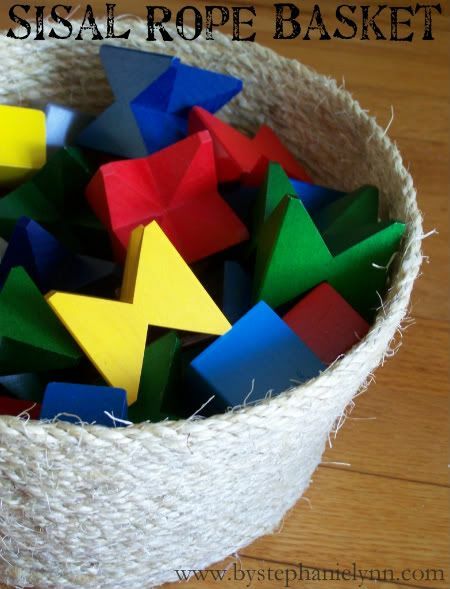 This ensures there is enough rope to complete the bowl – instead of cutting it too short. Continue gluing and rolling the clothesline rope until the coil is as large as the base of the ‘guide bowl’. For this project any glue gun will do the job, however, I have to mention my absolute favorite here. I have had this glue gun for 5 years and it is by far the best glue gun I have ever purchased. It comes with three different nozzles and the slender ‘needle tip’ works perfectly for projects like this, as it precisely places the glue exactly where you want it. 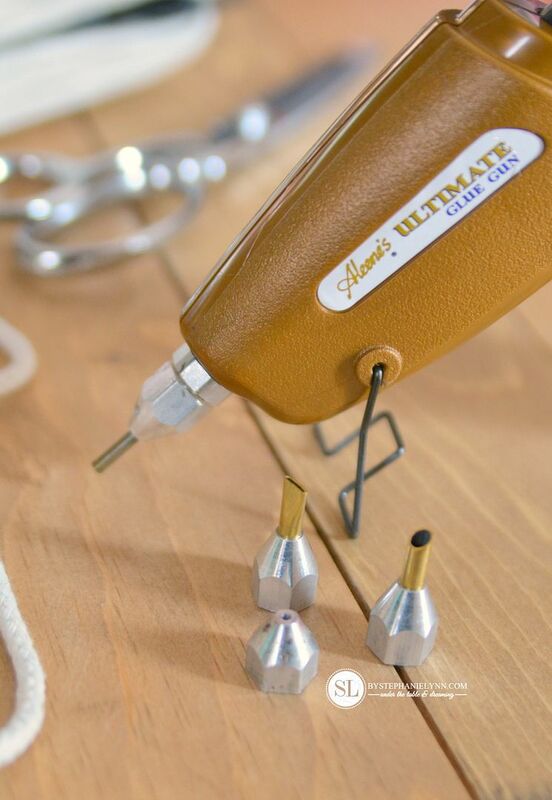 If you avidly use a glue gun this one is well worth the investment. 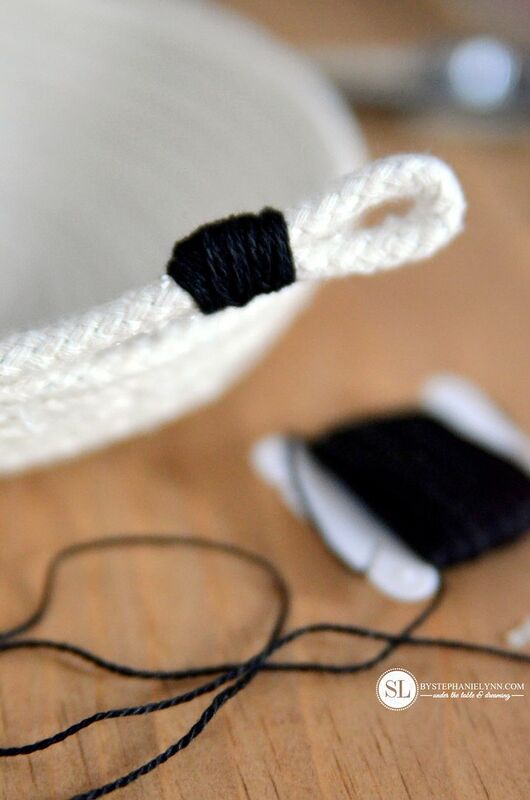 Step Two: Place the coil inside the ‘guide bowl’ and continue to glue and wrap the clothesline – following the shape of the bowl. Step Three: When the end is reached cut the clothesline roping, leaving an additional two inches of rope to create a finished loop. Roll the end of the rope back, as shown above, to create a loop. Secure the end into place with a dab of hot glue. 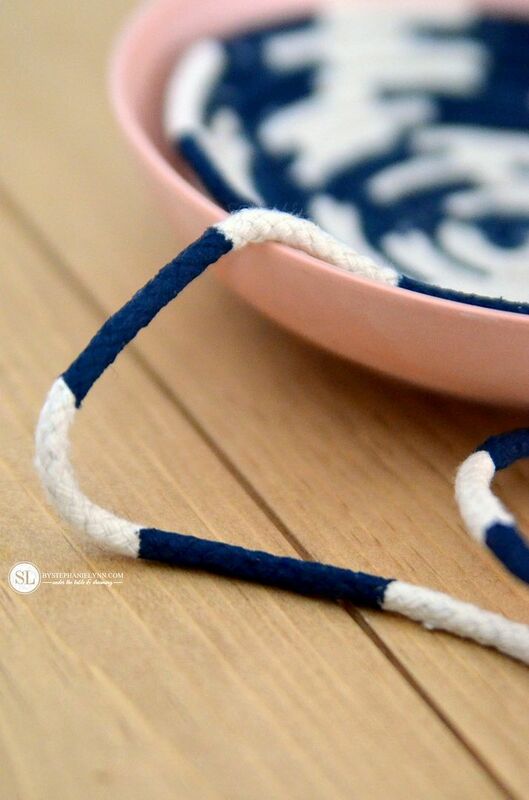 Finish the loop by wrapping some embroidery thread over the end, then secure the loop to the rim of the bowl with hot glue. Option One: Paint stripes on the clothesline rope using acrylic paint. 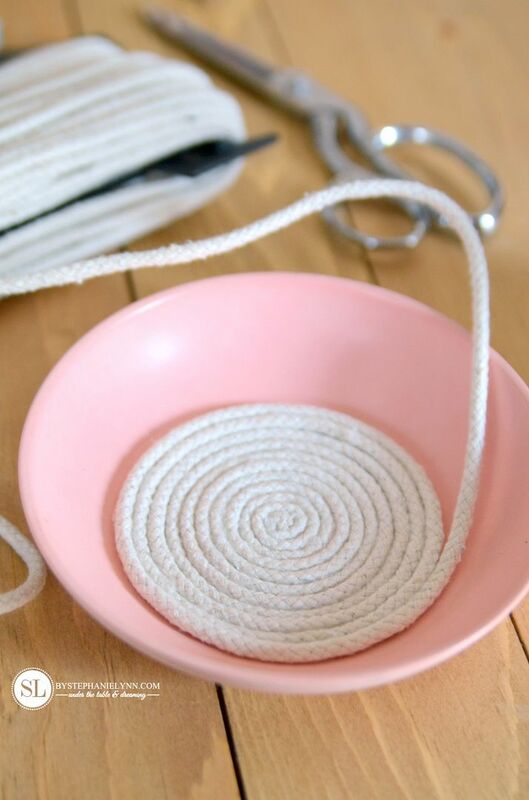 Once the paint has dried create the rope bowl using the directions details above. 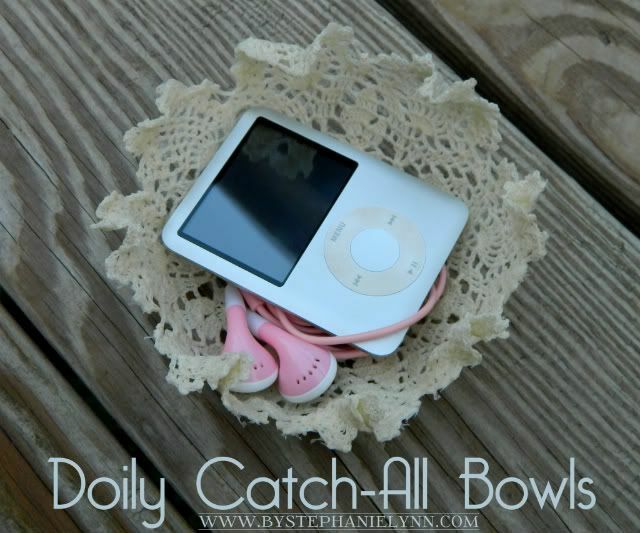 I love the pattern and design the paint adds to the bowls. Plus something about the dark indigo denim and natural creme cotton combo is so refreshing. The stripes were casually painted every 1 1/2 inches on the clothesline. Don’t worry too much about having them evenly spaced – once the rope is coiled you won’t be able to tell. Option Two: Paint the entire bowl – after it has been created – using acrylic paint. 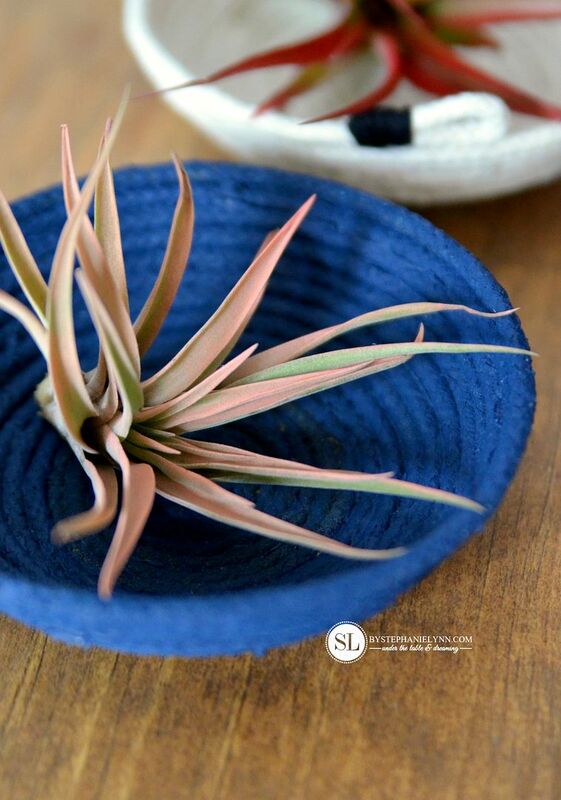 The rope bowls can be custom made as big, or as small, as desired. Our bowls ended up measuring approximately 6 inches in diameter. 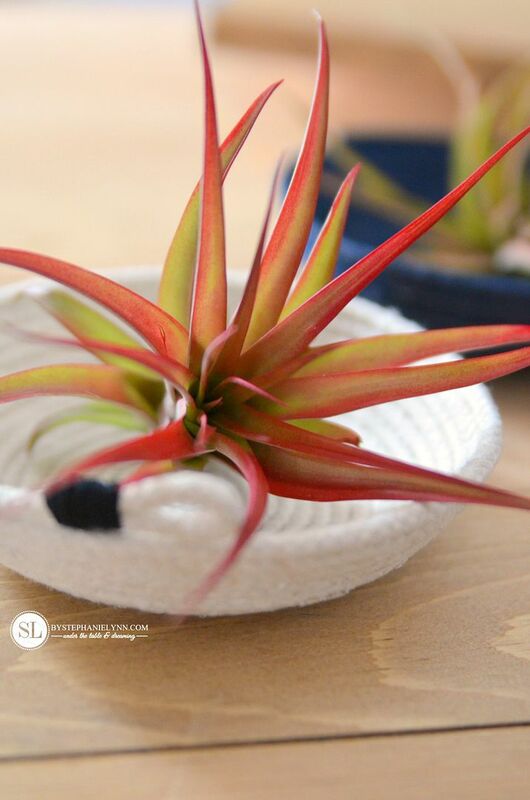 The perfect size to hold our air plants . 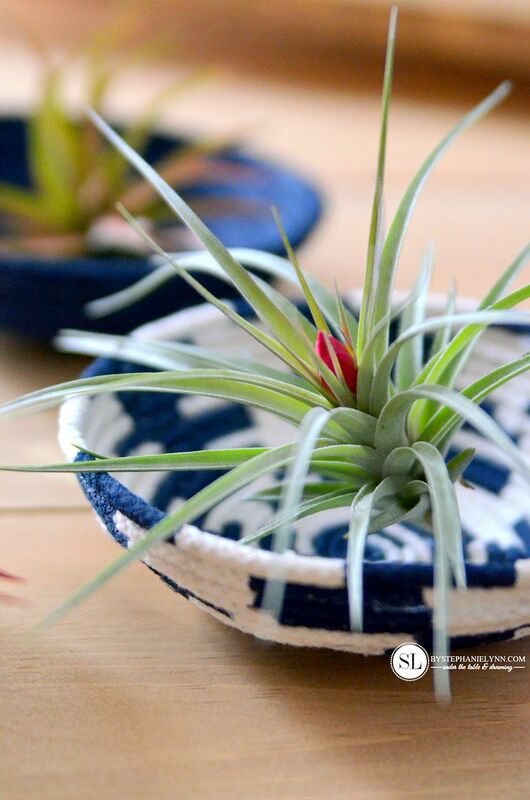 Air Plants, also known as tillandsia , are very low maintenance plants. As I mentioned above, they do not even need to be planted in soil to grow. They only require moderate sunlight and a good 20-30 minute soak in water every week. 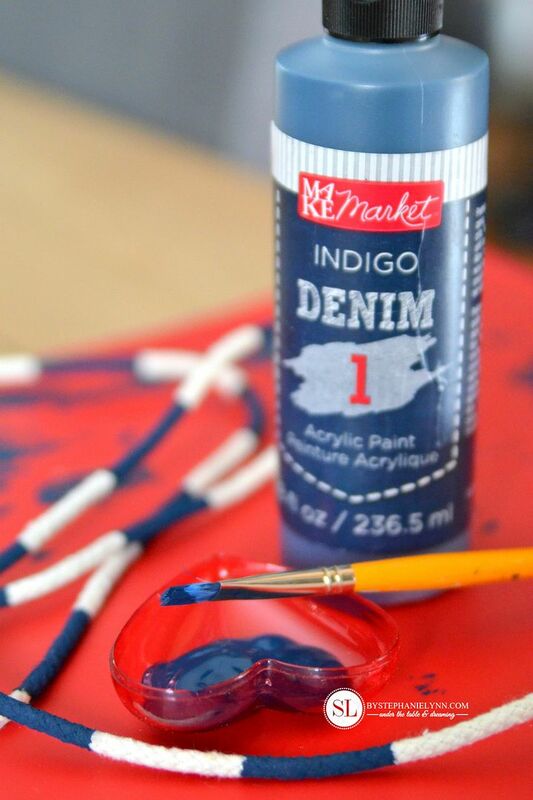 The Make Market™ Denim Paint can be used alone, as a basic acrylic or paired with the Make Market™ Glazing Medium and Weaving Brush to create a textured denim effect. This premium acrylic paint is available in three denim finishes – the dark indigo being my favorite. This post is brought to you by Michaels . The opinions read here are entirely my own. 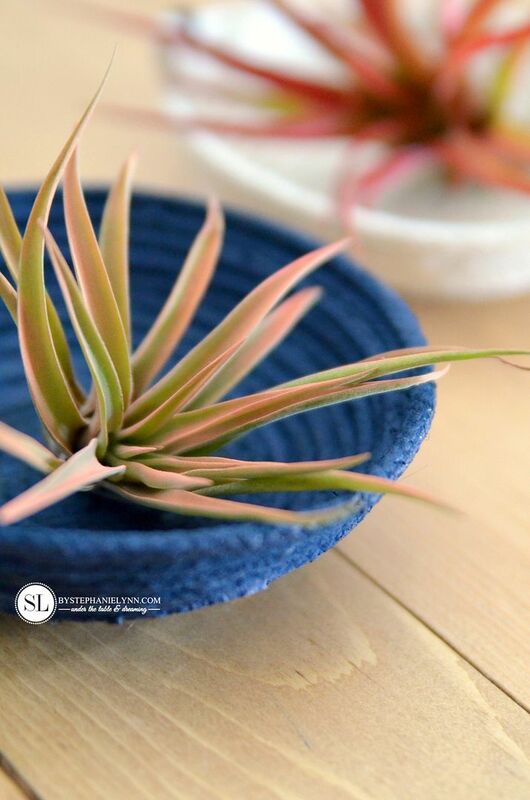 If you’re looking for some spring project inspiration, take a look at Michaels’ new Make Market line for DIY project and home décor ideas – all made with simple, on-trend surfaces and textures like chalk, denim, galvanized, burlap and cork. I just love those bowls they are so cute. 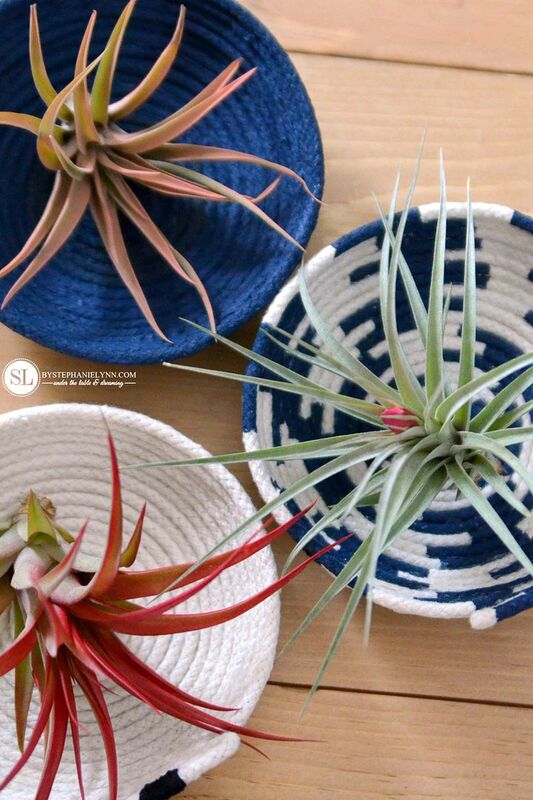 Also, I have never heard of air plants and will have to check them out, yours look so pretty and healthy. Thanks for the idea. Thanks Kathy. 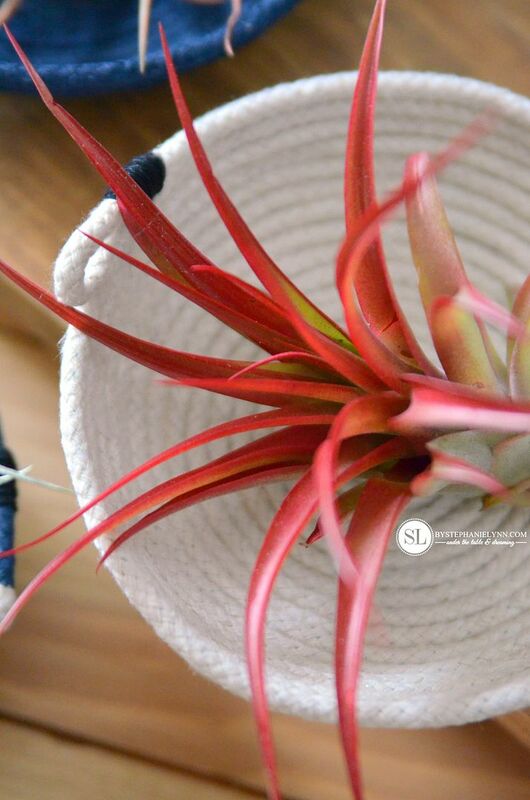 If you love indoor plants, you’ll love air plants – They are incredibly easy to keep alive! Super, super cute – pinning, and TFS. I see lots of potential pins here! Stephanie what a beautiful project using such simple supplies. Thank you for sharing such a wonderful idea even my girls might be able to tackle this one. Thanks Gigi – so easy too! I love the things you post and have done several of them. This one I will definitely do. 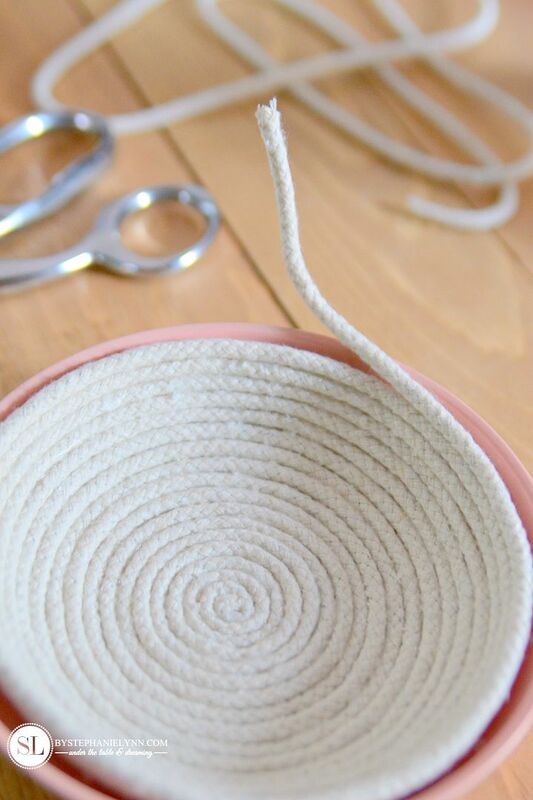 What lovely bowls, I like the extra details, like the neat way you finished the end of the rope with thread. Those finishing touches make all the difference.